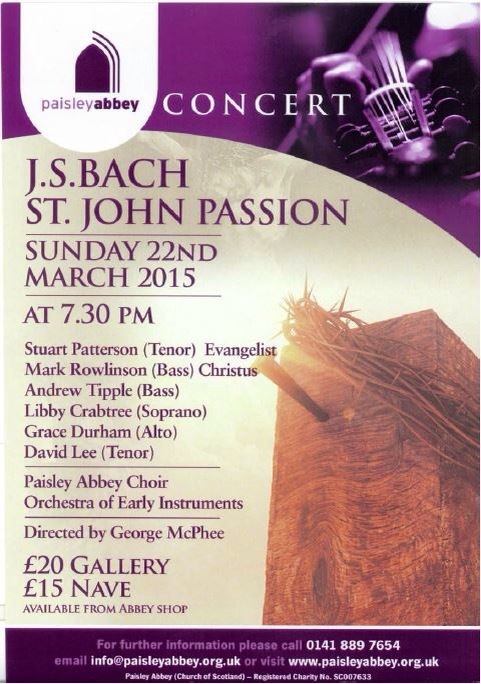 The performance of Bach’s masterpiece, the St. John Passion, will take place on Sunday 22nd March at 7.30 pm. It will be noteworthy for several reasons. Firstly, the Abbey Choir will be joined by several former choristers as soloists. The Evangelist will be Stuart Patterson who is now enjoying a successful career, mainly in opera in France and Switzerland. David Lee, who will sing the tenor arias, is a former boy chorister who has graduated (First Class honours in music) from Oxford University and who is now studying for a PhD at Glasgow University. He also sings extensively with various top British and continental chamber choirs. Andrew Tipple (Bass) was a recent choral scholar with us after his student days in the choir at King’s College Cambridge. Mark Rowlinson will sing the important role of Christus and he is no stranger to us. He is currently a member of the BBC Daily Service Singers. Two years ago we marvelled at the voice of Libby Crabtree in Bach’s B Minor Mass and it will be a delight to welcome her back. Libby is a regular member of the ‘Sixteen’. The choir will be accompanied by an orchestra of top baroque instrumental specialists and both harpsichord and organ will be played by David Gerrard, our Assistant Organist from last year. It is to be hoped that the performance will be a fitting addition to to the Abbey’s Lenten devotions.